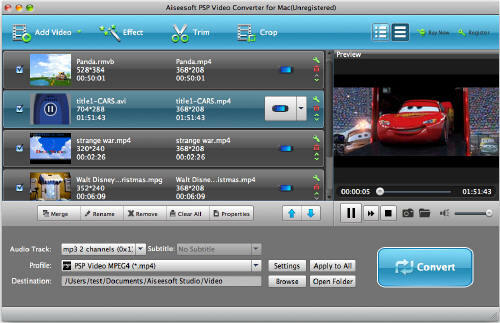 PSP Video Converter for Mac can convert all sorts of video formats such as MOV, 3GP, AVI, RM, MPEG, ASF and FLV to PSP Video (PSP MP4 video, PSP AVC H.264 video), PS3 Video MPEG-4 (480p, 720p) on Mac OS X (include Mac OS X 10.5 leopard) with great output quality. This video to PSP converter has various useful features such as batch conversion, setting video brightness, contrast, saturation, video file trim, video crop, and joining multiple files into one file. A professional mac avi converter developed only for Mac OS X users. Convert video to PSP video to play on your PSP player on Mac OS X. Convert MOV, 3GP, AVI, RM, MPEG, ASF and FLV and so forth to PSP video and audio. Crop video to remove the black video sides. This PSP converter for mac lets you merge all added files and output one file. You can trim your video files to only convert a part of a video file. Set video brightness, contrast, saturation, and choose to apply special video effects to your video files. Set video output settings including resolution, frame rate, encoder, and bit rate, and set audio output settings including sample rate, channel, encoder and bit rate. Using this PSP video converter, you can capture pictures by clicking the snapshot button while previewing the Video. Preview your video files before conversion to adjust the output quality. PSP Video Converter can convert video to PSP without any hassle! Why choose PSP Video Converter for Mac?